A slim fit suit isn't just the way a suit fits but is a way of life for young style minded men. You're just not going to young men wearing any other type of suit but a slim fit suit if style means anything to them. Slim fit suits are just the only style of suit that a young man will wear these days. 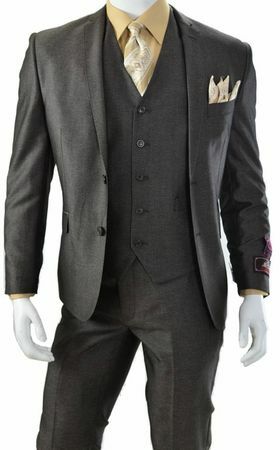 This sharp looking heather brown slim fit suit comes as a 3 piece with the matching vest. You'll find that the slim fit style jacket has everything you could ever want in a slim fit style suit like the tighter fit and narrow style lapels as well as side vents in the back with the no pleat style pants with the flat front and slim fit. Fabric is poly/rayon with a fine wool feel.